One of the most serious risks facing pet owners nationwide is heartworm. While most people think about heartworm treatment for dogs, there are other domesticated animals that are affected as well. Speak with your Dartmouth vet hospital about prevention and treatment for cats and ferrets, as well as other animals that are at-risk in your area. Heartworm is extremely serious and can be potentially fatal, but the good news is that this dangerous parasitic disease is also preventable. The first thing you need to know about heartworm is that it is transmitted from one animal to another by mosquitoes. 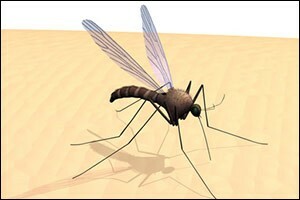 Some people mistakenly believe that it is mosquito larvae that is infecting the animal, but the truth is that mosquitoes carry the parasite and it gets transmitted to an animal through a bite from the mosquito. All types, sizes and breeds of dogs, as well as cats and ferrets, are at high-risk for this disease. Indoor and outdoor pets can be affected as well, so prevention should not be limited only to outdoor pets. In fact, any pet that has been exposed to mosquitoes should be tested by professional veterinary care in Massachusetts to ensure they aren’t infected. If you have not visited your local animal hospital in Dartmouth to get your pet tested, you will need to watch out for signs of illness. However, it should be noted that unless the adult worms have already developed in your pet’s lungs, they might not show any symptoms of illness at all. As the adult worms grow and spread, your pet may experience difficulty breathing and begin to cough, as respiratory distress sets in. Loss of appetite and lethargy are two other symptoms seen with heartworm disease. Diagnosing heartworm in cats can be more difficult than with dogs, as a series of different tests may be required. Even then, sometimes the tests are inconclusive. However, just one worm in a ferret can cause severe problems. In fact, the American Heartworm Society now suggests regular check-ups for ferrets and year-round heartworm treatment, as they do with dogs and cats. The best “cure” for heartworm is to prevent it from happening in the first place. Heartworm treatment for dogs, cats and ferrets can be quite costly and, in some cases, by the time the pet owner realizes that something is wrong, it can be too late. Bring your pet into the Anchor Animal Hospital in Dartmouth for heartworm testing and follow up with preventative heartworm treatment for dogs, cats and ferrets, according to the veterinarian’s recommendations. If your dog is diagnosed with heartworm disease, there is a treatment available. However, there is considerable risk involved, as well. Make sure to follow your instructions for veterinary care in Massachusetts carefully to reduce the risk of complications. Your vet may also prescribe additional medications to help control inflammation in the body as the worms die and become broken down in your dog’s lungs. In some cases, surgical removal of heartworms may be warranted in severe cases. Unfortunately, there currently is no FDA approved treatment for heartworm disease in cats. Your veterinarian at Anchor Animal Hospital might recommend a variety of medications to help reduce inflammation or may recommend surgery to remove the heartworms, if required. Because of the inherent danger to cats due to the lack of medical treatment, it is more important than ever before to speak with your vet at the Dartmouth vet hospital about testing and preventative treatment as soon as possible. In addition to bringing your pet in for veterinary care in Massachusetts for preventative heartworm treatment for dogs, cats and ferrets, there are other things that you can do to help reduce the risk for your pet. Speak with local vector control about staying on top of area mosquito populations. Not only do mosquitoes spread heartworm to pets, but they also spread lots of other dangerous diseases to humans. Ask what you can do to reduce breeding opportunities on your property and in your area, such as keeping your yard clean and free of areas where water could collect and become a mosquito nursery. There are other recommendations that you might receive from your veterinarian at the local Dartmouth vet hospital when you bring your pet in for a check-up. Depending on the type of pet you have, your pet’s lifestyle and other risk factors, your veterinarian will recommend a type of preventative heartworm treatment for dogs, cats and ferrets that meets your unique needs. Heartworm infection is almost one hundred percent preventable in cats and dogs, so meeting with your veterinarian and making a prevention plan is the best way to protect your beloved pet. If you live in the South Coast area and have a pet that could be potentially affected by heartworm disease, such as a dog, cat or ferret, make an appointment as soon as possible at Anchor Animal Hospital in Dartmouth to get a check-up. Make sure to ask about preventative heartworm treatment for dogs, cats and ferrets, as well as other important vaccinations and seasonal preventative treatments. Give us a call at 508-996-3731 to find out more about our services or to schedule an appointment.